Happenstance for the win today in the #sparkchamber as we revel in the good fortune of dropping into a gallery on a day when the artist happened to be present. On a rainy afternoon in Tarpon Springs , FL, a purposeful bike ride to the Leepa-Rattner Museum of Art led us to visual artist Nathan Beard. Nathan specializes in acrylic paintings, abstract representations of the fleeting moments of his everyday life. Inspired by the density and variety of Floridian flora, and conceptually drawn to interweaving layers and its metaphorical application to memory recall and moments of time, his work is based on recollections of the sensations, colors, and spaces he perceived in the moment. He uses a variety of processes to achieve complex, multi-layered surfaces inspired by the human conception and experience of Space-Time. With painter’s tape, rubbing alcohol, and soil, he creates organic, rhythmic patterns with a strong emphasis on the perception of movement through variegated color relationships. He exhibits widely throughout the Tampa Bay region, and is represented locally by ARTicles Art Gallery [St. Petersburg, FL] and in Japan by agent Noriko Kuehn. 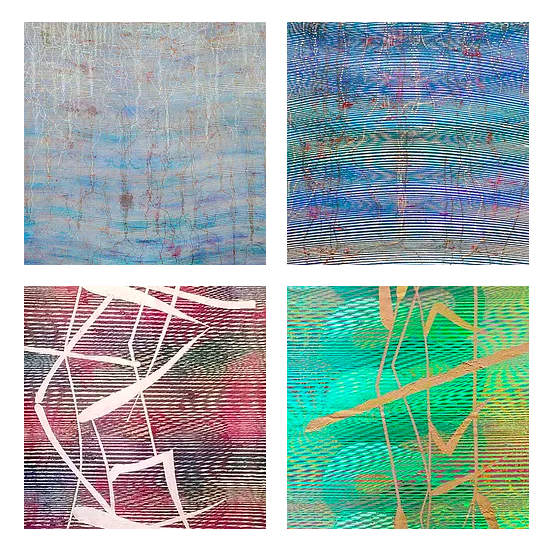 His latest series of paintings, Life Lines, is on view at LRMA through May 2019 as part of the exhibit Unexpected: Art by Alternative Means. Nathan grew up on a dairy farm in western New York. He was an exchange student in Egypt for a year, and, upon his return, worked as a cowboy in Wyoming for two years. He attended Colorado State University, graduating with a Bachelor of Fine Arts in 2001. He stayed in the Denver area for seven years, working in multiple galleries, and as an art consultant. He now maintains a studio in St. Petersburg, FL, where he lives with his wife and seven-year-old daughter. In addition to his painting, he also serves as Curatorial Assistant at Dunedin Fine Art Center, as Preparator for Scarfone/Hartley Gallery [University of Tampa], and as Independent Art Installer for residences, businesses, galleries and museums throughout Tampa Bay. Visit his website to see more of his wonderful work. Ideas come from everywhere — reading, conversation — but my most interesting ideas come to me as I wake up. They dawn on me, pun intended. But it’s not ideas that come so much as it is connections between different ideas. They really are Ah-Ha! moments that allow me to move forward on a project where I didn’t know how to visualize my intuitive understanding of something prior to that moment. Other ideas come as malleable answers to questions I’ve been asking myself about notions of meaning, purpose, self-similarity, and interconnectivity. I use my work and creative process to meditate upon the connective patterns underlying events at vastly different scales, the all-too-human tendency to reduce complex relationships to contrasting dualities and the potential congruity between human will and natural forces. I seek a deeper understanding of the intricate relationships between matter, space, energy, and time. Ultimately, I want to know for myself where we come from, whether or not I am actually scared of dying, and to fully understand the paradox of the inwardly infinite. 3.] Early bird or night owl? Tortoise or hare? I mainly work in short stints and work best in the early and mid-morning hours. Though when up against a deadline, I will work for extended periods of time at any hour I can. The reason I work short stints is due to my constantly changing art-installer schedule, my daughter’s school schedule, and my wife’s schedule. She teaches GED in the evening and is pursuing pre-med studies. When I feel unmotivated, I remind myself how fortunate I am to do what I do, how little time I have on the planet to do it, and how numbing any other alternative might be. When I think I can do no more and that I have reached my limit, I think about the field-day race I lost in 2nd grade. With a large lead and the finish line in sight, my legs became weak and I fell down. Instead of getting up and doing the best I could to finish, I cried. At least that's how I remember it, anyway. I won’t be that little boy. Because of the nature of my process, it is easy to know when I am done with a painting: when the last piece of tape has been removed. It is harder to tell when I am finished with a particular body of work or series of paintings because there always seems to be more to explore.